Not long after first meeting Stefan Bradley in 2003, I heard him start talking about developing a research project. Here and there over the years, he'd mention visiting archives and special collections at various Ivy League universities. He was working on various other activities, but he always had his eyes on this one large scholarly project as well. A year or so ago, he sent me a few pages from chapters in the developing manuscript. So this is what he's been up to, I thought to myself as I read along in the drafts he was writing and sharing. But even then, I wasn't fully aware of the scale of what he was doing. 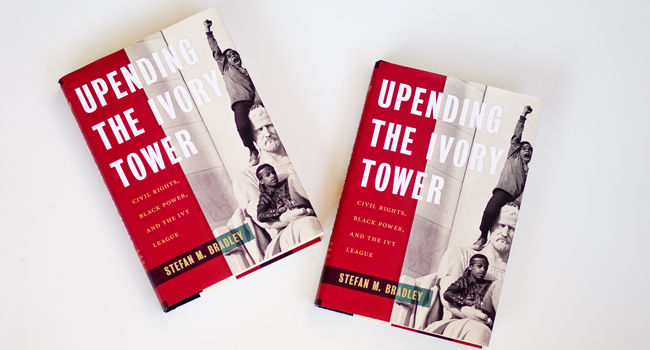 The publication of Bradley's Upending the Ivory Tower: Civil Rights, Black Power, and the Ivy League a couple of weeks ago represents the result of years of effort -- thinking and rethinking, travel, research, writing, more thinking, and revision. This current book extends what Bradley produced with Harlem vs. Columbia University: Black Student Power in the Late 1960s (2009). Here, in Upending the Ivory Tower, he concentrates on the experiences, really the struggles, of black students at 8 prestigious and storied universities: Harvard, Yale, Princeton, Penn, Columbia, Brown, Dartmouth, and Cornell. He explains how thinkers and activists associated with Black Power movements positively influenced who gained access to these powerful universities and what black folks did once they got there. I've started working my way through Bradley's important book. Next week, some of my students, colleagues, and I will welcome him to SIUE for a talk about his work and various topics. More on that soon. For now, I'm going to say I'm just glad to have been a witness, as the elders used to say. Catching bits and pieces of Bradley talking about this project over the years, hearing about him making visits to those universities libraries, and realizing he was putting in far more work than he talked about publicly is really something worth noting.